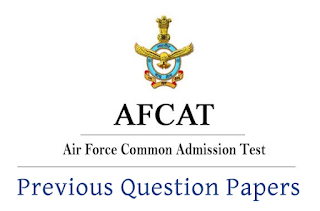 AFCAT Previous Year Papers: Job Aspirants can begin the preparation for AFCAT Exam using the AFCAT Previous Exam Question Papers provided here. AFCAT (Air Force Common Admission Test) is an entrance exam for candidates wishing to join the Indian Air Force as a flying commissioned officer, ground duty (technical) and ground duty (non-technical). The exam will be conducted in online mode, which is a computer-based test. The questionnaire will be available in English only. The total number of questions asked in the AFCAT Exam will be 100. The exam will consist of 4 sections: general knowledge, verbal ability in English, numerical skills, reasoning, and aptitude test. Each question carries 3 marks so the total is for 100*3=300 marks with a negative marking of -1. The duration of the exam will be 2 hours. Candidates who want to apply for Ground Duty (Technical) exam, they have to attempt EKT exam along with AFCAT. EKT exam will be based on the respective engineering discipline chosen by the individual. Applicants need to go through the previous papers of AFCAT exam to know the exam pattern in detail. Job Ring is advising to practice the AFCAT previous year Question papers of last 5 years and model papers available on the internet. By preparing the previous papers you will get to know the type of questions frequently asked in AFCAT. So Job Ring has gathered previous papers and Model papers to help the students. Please go through the below links for AFCAT previous papers with solutions.